Some pictures of Minnehaha Falls and the area around it add more mystery than they solve. This picture shows the 1880s fence on the north side of the falls. It shows that the ground was trampled bare on the south side, which was a problem the Park Board worked to solve as soon as they took ownership. There are nearly no other pictures of Minnehaha taken from this spot. This is a unique image. 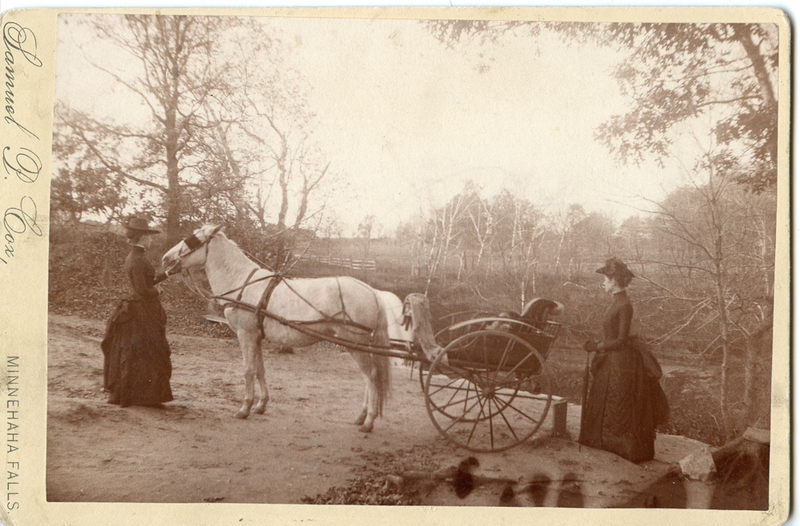 Two young women had their picture taken with their horse and buggy at Minnehaha Falls. Samuel P. Cox had the photography concession at the Falls before, during, and after the change of ownership in 1889. He was there from at least 1887 to 1891. From the urban creek.com archives. In 1752, it was decided that George Washington was born on January 22, 1732. Before that, he was born on January 11, 1731. It is not known how he felt about the change. Two hundred years later, much was made of the bicentenary anniversary of Washington’s birth. A national commission was formed in late 1924, chaired by President Coolidge. The group needed seven years to plan sufficient honors for the occasion. And, indeed, states formed their own commissions, histories were written or rewritten, music was composed, and a seemingly vast amount of celebration occurred. And one of these celebrations was orchestrated by the (now defunct) American Tree Association. The Washington Bicentennial Tree is located near the north end of the pergola on the south bank of the creek. Picture from the urbancreek.com archive. Their idea was to plant trees, of course. The American Tree Association put out a booklet describing the idea, and yes: It’s about as sappy as possible. The Tourist Camp, part 2. From a slow and steady start, Minnehaha’s tourist camp blossomed into a popular destination. After only a few years, more than 4,000 cars a season came through the camp. In the 1850s through 1880s, Minnesota had been proud of her ability to draw in southern tourists escaping the sultry heat of summer. In the automobile age, tourists came from much closer. Iowa, Illinois and Wisconsin provided 43% of all Auto Tourist Camp tourists in 1925. Add in Minnesota herself and the Dakotas to find that 63% of the Tourist Camp users were regional folks. The postcard craze of the early 20th century preserved some images that might otherwise be lost. 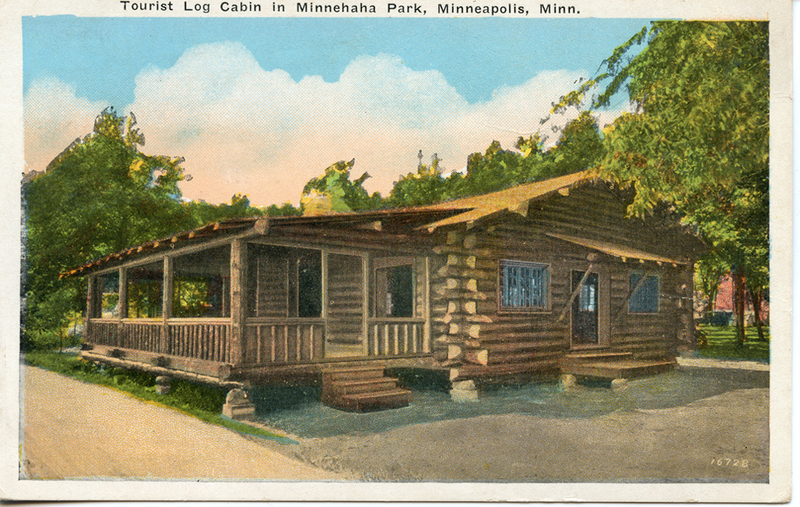 This image of a log cabin in Minnehaha Park’s Auto Tourist Camp may have given people the idea that this cabin was available for rental in the camp. Author karenPosted on September 8, 2016 September 16, 2016 Categories 20th Century, Tourist CampTags lock & dam, Park Board, postcard, Tourist Camp3 Comments on The Tourist Camp, part 2. The Tourist Camp. Part 1. In June of 1921, a long-planned idea of Theodore Wirth’s came into being. He had been the superintendent of the Minneapolis Parks since 1906, all during the time when America’s personal transportation system was switching from horses to cars. In 1920, he had enlisted the enthusiastic support of the Civic and Commerce Association. Plans were being considered to put a camping place at Lake Calhoun, Glenwood Park, or The Parade for tourists arriving at Minneapolis in automobiles. The Northside Commercial Club beat him to it. In June 0f 1920, they opened a camping place for 200 cars under the bridge at 42nd Ave. N. Maybe that was nicer than it sounds. 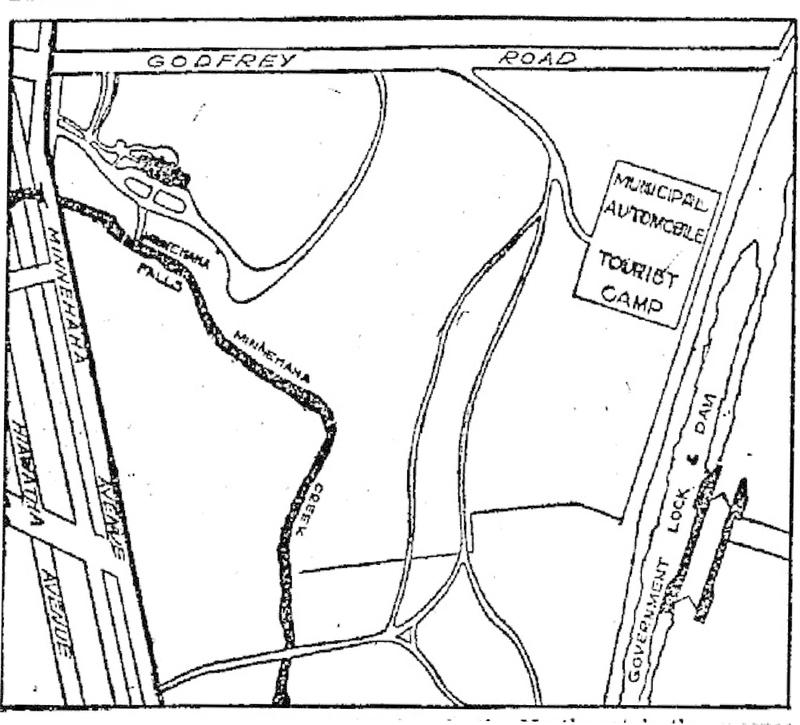 The north-siders also opened another camp in 1920 at Camden Park. The site of the Minnehaha Auto Tourist Camp was announced in April, 1921. Author karenPosted on August 19, 2016 September 12, 2016 Categories 20th Century, Tourist CampTags 1906, 1920, 1921, HCL, Park Board, Tourist Camp, WirthLeave a comment on The Tourist Camp. Part 1. The WPA workers in Minnehaha Park accomplished lots of small tasks. They repaired playground equipment, trimmed trees and painted and repaired “stationary settees,” traffic signs, and fences. One of their efforts was to erect a ten-foot fence across the faces of the sand caves in the glen as a safety measure. The existence of caves in the park might come as a surprise to today’s urban explorers. Stories exist of actually room-like caves, but no photographs have been found. This picture of a “cave” is no more than a shallow indent in the sandstone cliff. 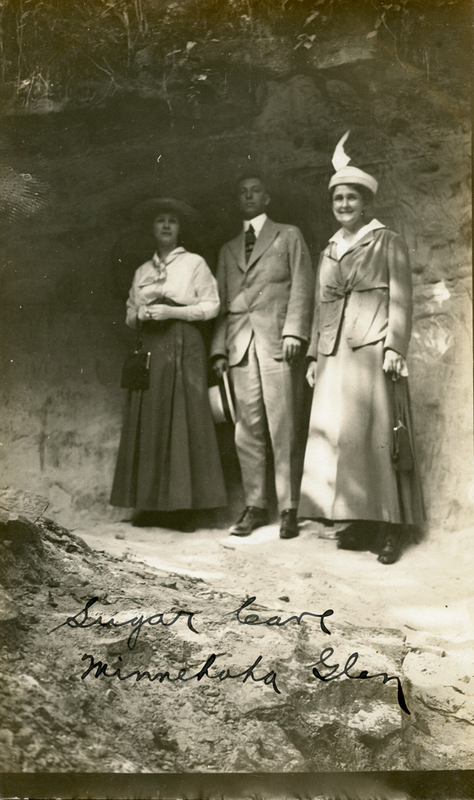 “Sugar Cave Minnehaha Glen,” in an undated photograph (a Real Photo Postcard) from the early 20th century. This cave does not seem deep enough to keep the rain off. The WPA Works in Minnehaha Park, 1936. Part 5: Picnic Shelter Maintenance. The Picnic Shelter in Minnehaha Park, designed by Harry Wild Jones in 1892. The design is reminiscent of a similar, much larger pavilion at Lake Harriet. This photograph is of unknown provenance and was published in a 2013 research report for the Park Board. It appears to be (but isn’t) a cropped and horizontally flipped copy of the image further down in this post, which was published by the Park Board in 1936. These pictures are both cropped (and one is flipped) from a single larger image. 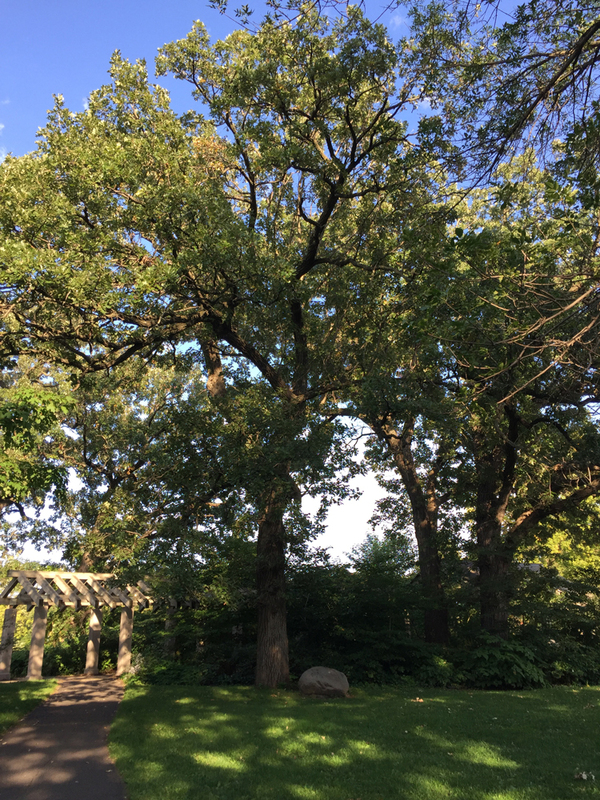 Author karenPosted on July 28, 2016 September 29, 2016 Categories 20th Century, Early Park Board Changes, WPA works at Minnehaha ParkTags 1903 refectory, 1936, Park Board, picnic shelter, WPALeave a comment on The WPA Works in Minnehaha Park, 1936. Part 5: Picnic Shelter Maintenance. The WPA works in Minnehaha Park, 1936. Part 4: A Spring in the Park. 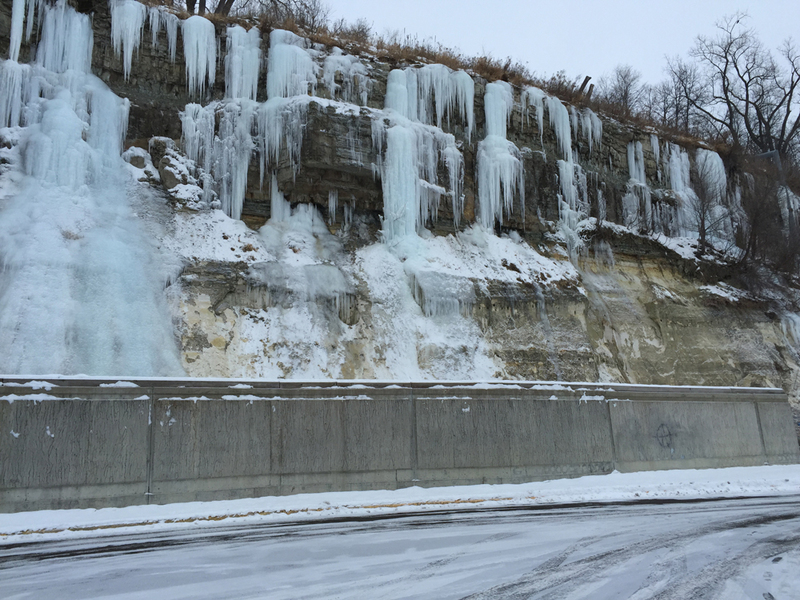 There’s a lot of groundwater just below the surface in the Minnehaha Falls area. This is hardly a surprise to anyone who takes winter walks in the park. Frozen ground water in Minnehaha Park. This was taken below the Wabun Picnic Area, standing on the driveway at Lock and Dam #1 on January 24, 2016. Author karenPosted on July 25, 2016 September 29, 2016 Categories 20th Century, mysteries, revised, WPA works at Minnehaha ParkTags 1936, groundwater, HCL, lock & dam, Park Board, springs, WPALeave a comment on The WPA works in Minnehaha Park, 1936. Part 4: A Spring in the Park. The WPA works in Minnehaha Park, 1936. Part 3: Driveway and Sidewalk. 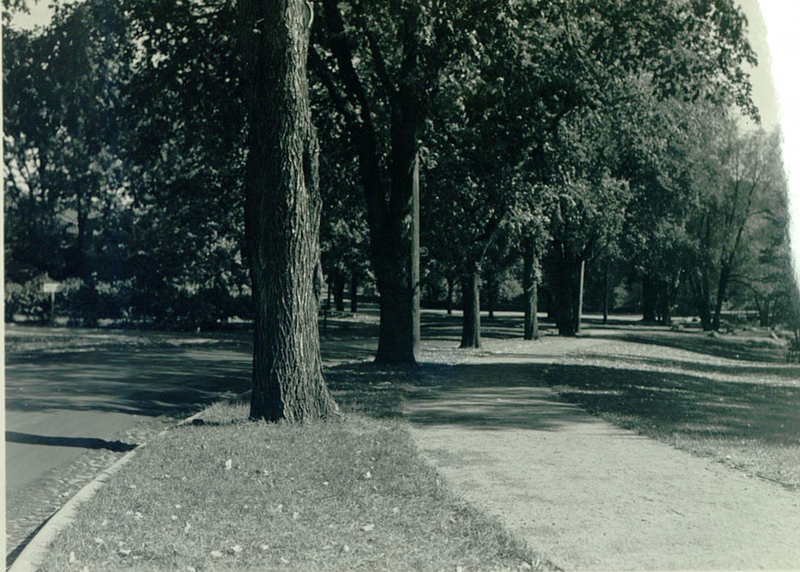 The original caption was: “Looking east from entrance to Minnehaha Park, showing curbing and walk installed by W.P.A.” The original photo comes from “The Story of W.P.A. and Other Federal Aid Projects in the Minneapolis Parks, Parkways and Playgrounds, for the Year 1936, Minneapolis, Minnesota.” Courtesy Minneapolis Park Board. Minnehaha Park cannot be said to have an entrance today. Years ago, when the streetcars and the trains dropped people off at the Minnehaha Depot, or nearby it, the crowds moved towards the Falls from the west. Or, they drove their carriages or automobiles down this driveway to pause in between the Refectory and the Falls and see the waterfall. Author karenPosted on July 23, 2016 September 29, 2016 Categories 20th Century, Early Park Board Changes, WPA works at Minnehaha ParkTags 1892, 1903 refectory, 1936, driveway, Park Board, WPALeave a comment on The WPA works in Minnehaha Park, 1936. Part 3: Driveway and Sidewalk. The WPA works in Minnehaha Park, 1936. Part 2: Groundskeeping. From the earliest years of Park Board ownership of Minnehaha Falls, they worked to grow the grass. For most people, a park implies green grass lawn under mature trees. Certainly this was the accepted ideal in the infancy of landscape architecture, around the time the Minneapolis Parks system was created. Picturesque contemplation of the natural (though created) terrain was more important than playing ball, flying kites, or flower-picking. The Park Board gained control of the Falls in 1889, the same year it created ordinances outlawing all these activities in the parks. They had a point, because back then, the falls were surrounded by barren dirt, and neither the landowners nor the businesses who rented from them cared much about growing grass. Minnehaha had for decades been the most famous spot in Minnesota, always attracting large crowds. All those feet made growing grass unpredictably difficult for the Park Board, even with great expenses for seed and with placing “Keep Off The Grass” signs. This was a struggle every year. Author karenPosted on July 21, 2016 October 7, 2016 Categories 20th Century, WPA works at Minnehaha ParkTags 1903 refectory, 1936, Park Board, picnic shelter, WPA1 Comment on The WPA works in Minnehaha Park, 1936. Part 2: Groundskeeping. The WPA works in Minnehaha Park. 1936. Part 1: Retaining Wall. The WPA (Works Progress Administration, which became the Works Projects Administration in 1939) provided the dignity of a job to the unemployed of America’s Great Depression, while supplying rural communities needed public infrastructure and giving art and amenities to the cities. 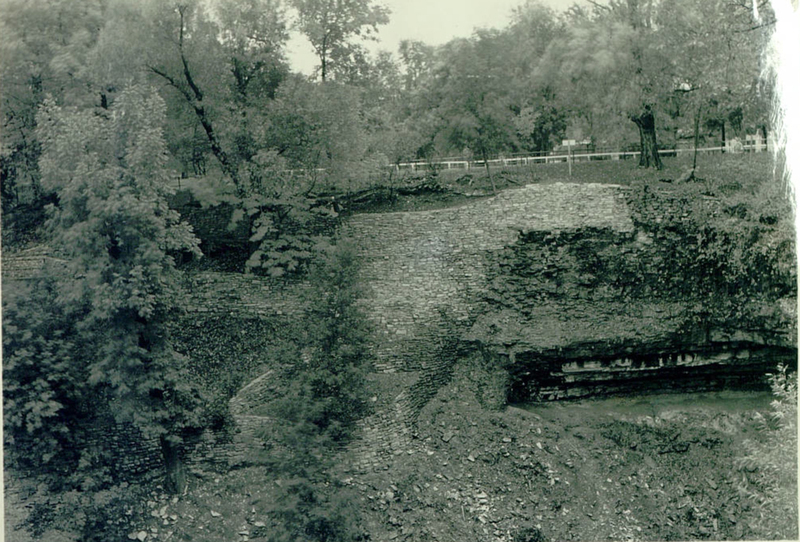 The WPA improvements in Minnehaha Park were invaluable, and many of those–staircases and such–still serve 80 years later. At some point between the late 1920s and 1936, the Park Board’s giant viewing platform was finally removed. It was replaced by… whatever this is. The original photo comes from “The Story of W.P.A. and Other Federal Aid Projects in the Minneapolis Parks, Parkways and Playgrounds, for the Year 1936, Minneapolis, Minnesota.” Courtesy Minneapolis Park Board. Author karenPosted on July 19, 2016 September 29, 2016 Categories 20th Century, WPA works at Minnehaha ParkTags 1900s, 1936, middle terrace, Park Board, slumping, WPALeave a comment on The WPA works in Minnehaha Park. 1936. Part 1: Retaining Wall.